What do you do if you find yourself bewitched? If you find you are constantly out of sorts, and you just know someone has put the evil eye on you? The answer is obvious: you must set about killing the witch who has bewitched you. But how do you set about killing a witch? Well, the first thing you do is to get a witch bottle. Any old bottle will do – often they are made of pottery – the type knows as bellarmines – but sometimes, as in this case, it is a wine bottle made of glass. In fact this was rather an old bottle, for it was made about 1685, but it was not buried till some time after 1720, so it was already some 40 years old when it was finally buried. It had been well-used too – note the chips on the rim: it had been re-used year after year for containing wine or other liquids. But finally, when it was too old for further use, it was turned into a witch bottle, and buried. Inside the bottle you put a number of objects that will do harm to the witch. Inside this one there were a number of bent pits – nine in all, each bent into an L-shape. Note how the head of the pin is made by winding wire twice round the shank and then cutting the ends. Then add some human hair – this example, highly magnified, was probably an eyelash. Also some wool fibres and leaves of some prickly grass, and then add the most critical ingredient: urine. Then bury the witch bottle, preferably in a warm place under the hearth, and when the witch tries to pass water, she will suffer dreadful torments and may even die. This works well even if you do not know who the witch is: you simply watch all your friends and neighbours, and if one of them suddenly falls ill, and possibly even dies, then that person must be the witch who is harming you. 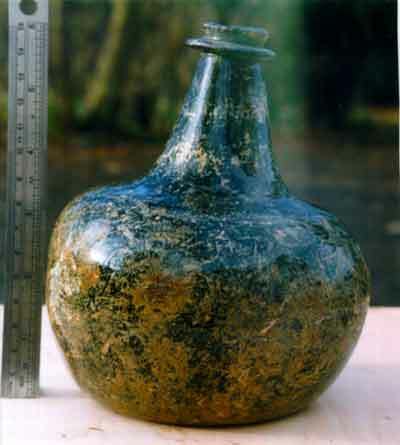 This witch bottle was dug up at Reigate, just south of London, where it was found buried in a ruined house. The bottle was however complete, the stopper was still in position, so it provided an unusual opportunity to examine the contents. Alan Massey, who has been studying witch bottles, was able to study the contents, and even to determine – with some difficulty – that the liquid was in fact urine. Whether the witch bottle was “successful” we cannot know: however witch bottles were often meant to explode when the witch finally expired, and as this witch bottle survived, perhaps it was a failure, and the witch survived too.